November 3 – Martin de Porres (December 9, 1579 – November 3, 1639). A lay brother of the Dominican Order who lived in Lima, Peru. He is the patron saint of mixed-race people and all those seeking interracial harmony.He was noted for work on behalf of the poor, establishing an orphanage and a children’s hospital. He maintained an austere lifestyle, which included fasting and abstaining from meat. 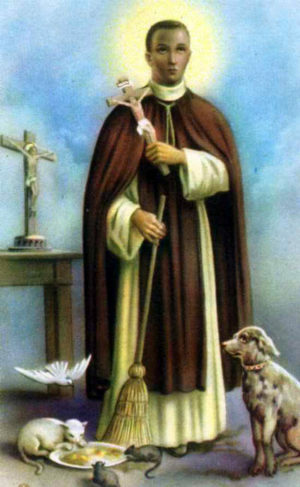 In iconography, Martin de Porres is often depicted as a young mulatto friar (he was a Dominican brother, not a priest, as evidenced by the black scapular and capuce he wears, while priests of the Dominican order wear all white) with a broom, since he considered all work to be sacred no matter how menial. He is sometimes shown with a dog, a cat and a mouse eating in peace from the same dish. Among the many miracles attributed to him were those of levitation, bilocation, miraculous knowledge, instantaneous cures, and an ability to communicate with animals.